The world knows Muhammad Ali as a boxing superstar, but few know that he once delivered a “KO” punch to tooth decay! 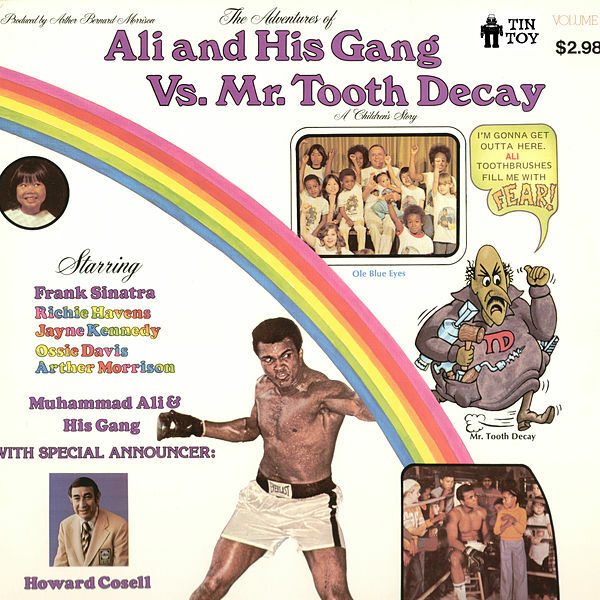 In 1976, Ali released a children’s record album called, The Adventures of Ali and His Gang vs. Mr. Tooth Decay. The PSA-type album featured the prizefighter himself, along with the voice talents of Frank Sinatra, Howard Cosell, and Ossie Davis. The recording combined music, narration and stories that encouraged children to have good dental practices. The album was endorsed by the American Dental Association -- and was nominated for a Grammy in the “Best Recording for Children” category. To promote the album, a special event was held in Washington, DC, and showcased Muhammad Ali boxing with fellow heavyweight champion Chuck Wepner, masquerading as Mr. Tooth Decay. The Adventures of Ali and His Gang vs. Mr. Tooth Decay is still available today though such sites as itunes and Amazon.